The ZBD-03 is the latest generation of airborne infantry armoured fighting vehicle used by the Chinese Armed Forces (PLA). The first generation of the ZBD-03 was called ZLC2000, this vehicle was designed, developed and manufactured by the Chinese Defense Company Norinco. The ZLC2000 tracked vehicle was introduced by the People's Liberation Army Air Force (PLAAF) in 2003. It has been designed for being air dropped by medium-sized transport aircraft such as Il-76M. NORINCO provided the ZLC2000 in three variants: command and control; infantry fighting vehicle; and anti-tank guided missile carrier. 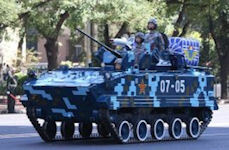 The ZBD-03 was presented for the first time to the public, during the military parade in Beijing, the 01 October 2010, for the 60th Anniversary of the People's Republic of China 1949 - 2009. The ZBD-03 is fully amphibious. The ZBD-03 armor protection is limited by its weight restrictions for air dropping. With acombat weight of 8 tonnes, the vehicle's armodr is supposed to be thin and can only resist small calibre weapons. Combat vehicles for the commando units began to be developed in China in the early 1990s to increase combat power and mobility of their own airborne units. At that time, even the available information about the negotiations with the Russian Federation to acquire the license for mass production of Russian BMD. Precise data on the establishment of airborne vehicles and prototype testing is not known (except for the serial number WZ506), with the ZLC-2000 taking into service in 2003. In the same year, the BMD was seen in the airborne divisions of China. In 2004, the parachute system «K/STW-17» was used for landing ZLC-2000 from transport aircraft. In 2005, this machine was adopted Chinese units involved in the joint Russian-Chinese military exercises. Although the machine is made in China and different from Soviet counterparts BMD-2/3 in appearance, almost all solutions were copied from the Russians. The machine is called ZLC-2000, but is also known as ZBD-03. The Chinese amphibious machine has a welded type hull with a sealed enclosure. The body is made of armor plates, front plate have high angles of inclination. Ballistic body armor and bulletproof. Fighting weight machine 8 tons. In the back of the troop compartment holds a capacity of five-equipped paratroopers. The management section includes the driver-mechanic with the input / output overhead hatch and observation devices, the commander with an input / output overhead hatch and their observational instruments. The troop compartment is provided with two emergency rectangular overhead hatches in the aft door for the implementation of ingree and egree, loopholes, glass blocks for surveillance and fire and mounted on the roof of the periscope. Anti-tank missile system HJ-73C with ammunition three missiles. The gun can fire single shots or fixed (3/5) salvos. The rate of fire 100/200 rds / min. Perhaps the last machines installed stabilizer arms. ATRA is installed on the roof of the tower on the left side, it is a copy of the Soviet anti-tank complex "Baby" modernized itself to the possibilities of "Baby-2." Uses a new warhead to destroy enemy armored vehicles mounted with dynamic protection. Guidance wire, semi-automatic. Range of the complex up to 3 kilometers. Located in the turret part of the operator-gunner is provided vision devices, combined optical sight (day-night TV). On the outer sides of the tower is equipped with two 3-block barrel smoke grenade. MTO provided by a diesel engine with air cooling. Suspension consists of a 5-lightweight Ridged ice rinks and a 3-roller-type supports. The drive wheel is a front-mounted. Hydropneumatic suspension has variable ground clearance, minimum exhibited in the commission of landing the plane in order to reduce the force of impact on the ground. ZLC-2000 - floating machine performance. To move across the surface of the water used rewind tracks and bars on the endings in the stern bulwarks cars by type Russian light armored vehicles. When entering the water hazard raise the bow baffle plate. ZLC-2000 is transported to the transport type of the Soviet Il-76MD. The aircraft is able to deliver to the destination of three amphibious vehicles and crews. Chinese parachute system «K/STW-17» braking system provided the powder type. LAW «HJ-73C» 3 missiles with ammunition. Self-propelled anti-tank complex. The main armament - LAW «HJ-8". Recently, a modification was seen of the ZLC-2000 with a 100-150 mm cannon. Precise data on this modification is not. Rather, China has created this modification on the example of Russia, which has created on the basis of BMD-3 - Octopus-SD (anti-self-propelled vehicle with a 125mm gun).